The Kronos Audio brand has taken the analogue world like a storm. 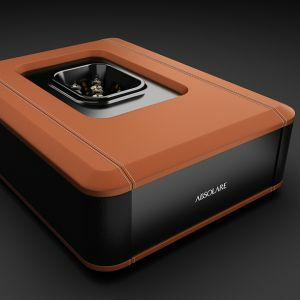 The company’s turntables, Pro Limited(only 250 units will be issued) and its lower priced sibling Sparta have garnered rave reviews and Best of Show Awards worldwide, including those from KLIAV 2015. Having experienced the Kronos turntables during the KLIAV 2015 show and befriended Louis Desjardins, I’ve come to know a great deal about the turntable and the person behind it’s unique counter rotating twin platter design. Louis is first and foremost a music lover and his main design goal to put music on the altar, above all else. A little after after the KLIAV show, Victor of Hifi-Creations asked me if I had some time to give the Sparta a spin. He knows that my man cave is very tight on space but filled to the brim with equipment, so the Sparta was a good choice, being a little smaller than the Pro. So the turntable was brought in to my cave, and after some fiddling, everything fitted, just barely. 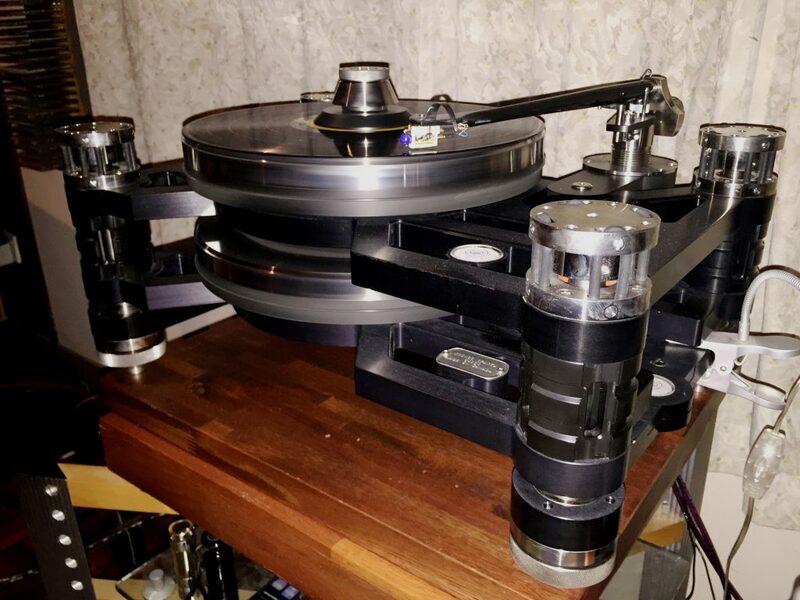 Victor equipped the turntable with the 10.5 inch Helena tonearm, a uni-pivot design with underslung counter weight, and ZYX Premium Omega Cartridge. I’ve always admired the lower range of ZYX MC cartridges, and here was my chance to listen to one of their top drawer designs (the one with the weird looking blue nose ball balancing weight made of Lapis Lazuli, a semi precious stone). 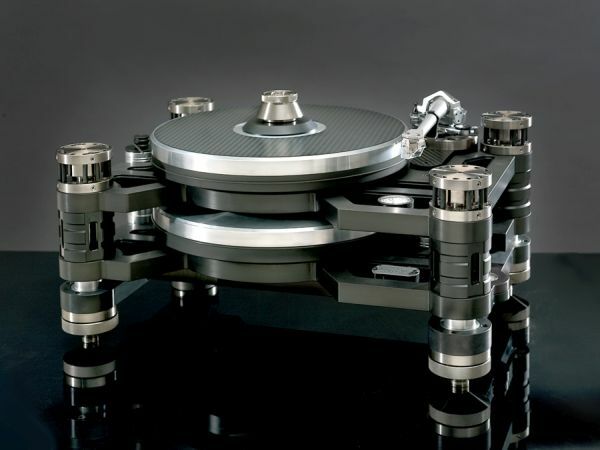 The Kronos Sparta looks like a well thought-out two tier suspended design, with dual counter rotating platters to cancel out torque force induced vibrations, suffered by all single platter suspended turntables. Until now, I was not aware of it’s existence, or of the negative effect of these vibrations on sound. I compared the sound of the Sparta playing with the two platters and then with only one platter, and found that when using only a single platter the result was similar to other turntables, but with both platters turning in opposite directions, the sound was completely different…and in the best of ways(more about this later)! Now I know that when it come to turn tables, there are the Kronos turntables,and there are all the others! 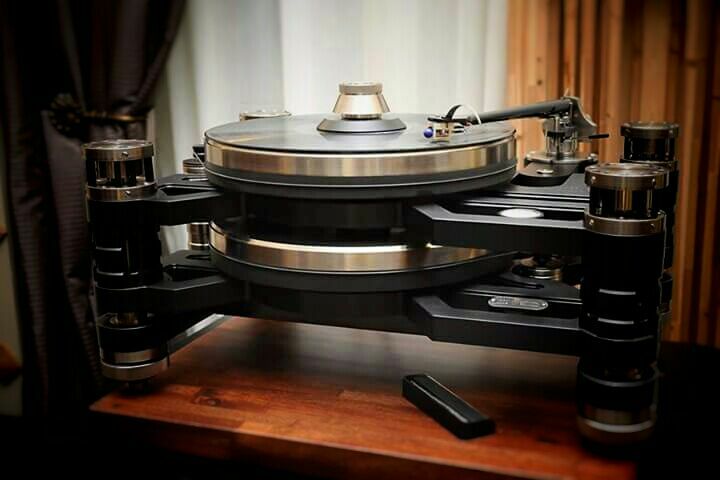 (note: Kronos also makes a single platter turntable called Sparta 0,5, that can be transformed into a dual platter marvel…hence allowing customers to buy in steps) All I know that if thinking about Kronos, think dual platter. Which to choose, Sparta or Pro Limited? Let your cheque book or bank account size decide. The Sparta also came with a small rectangular electronic speed control box (power supply), chrome faced finished. I found it was rather light-weight (the stiff handling Van den Hul Mainstream Hybrid power cord supplied by Victor frequently pulled down the electronic speed control box from my rack). When setting up the Sparta, one still needs to set the rotating speed accuracy by using the +/- key on the power supply box, then pressing M to memorize the setting. This needs to be done very rarely, as the motor speeds are computer controlled. As you set the rotating speed for the top platter, the bottom platter follows the adjustments of the top platter. Based on my visual observation each time after I had removed the LP and powered down the power supply and left the dual platters in free spin, I always detected the upper platter stopped spinning before the lower platter. Louis commented that this had nothing to do with relative operational speeds but had to do with DC resistance variance betwwen the two motors on slowdown, caused by the reversed polarity state of the two motors. The Sparta can be set to play at 33 or 45rpm. Kronos had thoughtfully supplied a record clamp which can be used in two ways. It may be used as a locking clamp, or a free weight. I chose to use the clamp as a free weight as the sound turn somewhat closed in and constricted when I lock down the clamp. Setting up the 10.5 inch Helena tonearm is a rather straight forward process, once you have mounted the cartridge on it’s head shell. The whole arm assembly can be easily detached from it’s uni-pivot point along with the internal wiring intact for convienience. An under slung counter weight design is used to lower the tonearm’s center of gravity for better tracking performance. In use, I found the tonearm’s screwed on to the headshell lifter mechanism easier to use than it pleased the eye, but that’s just my personal view of how things could be. The supplied ZYX Premium Omega MC cartridge is an open construction type design, which allows you to see all the bits inside its skeletal frame. The cartridge tracking ranges between 1.7 – 2.5 gr, which is quite a wide margin. (louis recommends 2 grams). Its output is 2.4mV, so your partnering phono stage must be of top notch quality, to be able to set high gain at near 72db, yet remain noise free. It has a recommended loading impedence of 100 ohms. Thankfully, my Pass Labs X-Ono is up to the job of supplying 72db gain with very little noise. However I kinda preferred to set the loading impedence at 475ohms rather than at 100 ohms, a matter of preference I guess, though the sound didn’t changed to drastically. I just felt the 475 ohms loading had a better grip on whole presentation and provided a more solid, well defined imaging while the 100 ohms loading sounded a little relaxed overall, with more naturally organic imaging quality by comparison. Now we come back to the power cord thing, the Sparta’s electronic speed control box didn’t quite gel well to the VdH Mainstream at all, I flipped around with some of my other resident power cord and it seemed that in the context of my system synergy, the Vermouth Red Velvet proved it’s mettle, by transforming the sound of the turntable. I found it hard to explain as the power cord only powers up the electronic speed control box, which in turn powers up those two little DC motors that rotates the platters in opposite directions, as there seems to be no direct connection, but yet the music seems to come out as the most coherent, with great vocal imaging presence and punchier dynamic range than compared to when the Sparta was powered by the VdH power cord. I used the Vermouth Red Velvet for the rest of the review period. 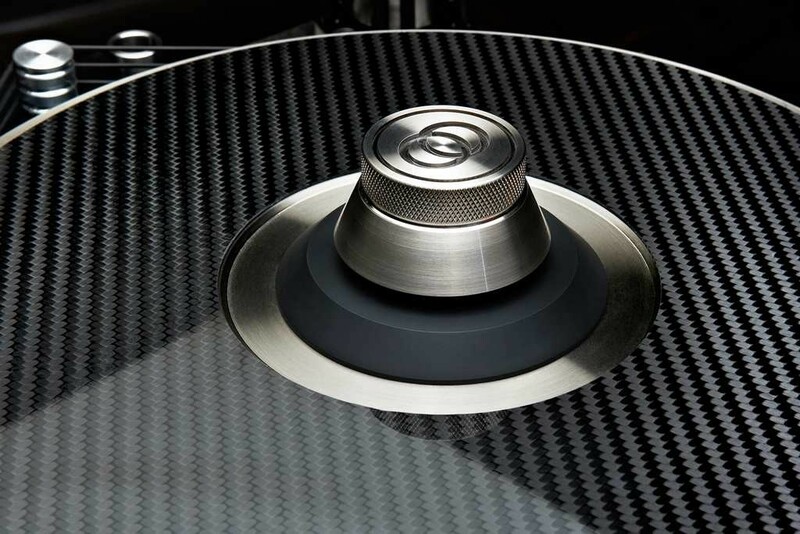 From the moment I laid my first LP on the carbon fibre surface of the top platter and lowered the tonearm to play, I knew this turntable was state of the art! The true absence of noise, what ever noise, surface or in groove dirt of a dirty LP, never unfazed the Sparta. The blank music-less parts in between tracks always felt, not heard I must say, truly and remarkably quiet! Even the LPs in my collection that I knew needed a good cleaning, sounded pristine and noise free on the Sparta! During the end of the review period however, I removed the drive belt from the lower platter so that it would not spin. LO & behold, some of the clicks and pops, the surface noise on the dirty LP mentioned above, became audible(though less intrusive comparatively to other turntables), just like on my very own Kuzma. There was also some loss of rhythm & drive in the music, compared to when both platters were counter rotating. Music felt like it has lost the melo-dramatic effect, reducing the overall emotional attachment to the performance. The overall sound signature became like familiar analog, like any other regular ‘good’ turntable. So far I’ve not even started on the music just yet, but any turntable that could filter out surface noise without resorting to electronics has already won the day, by the fact that it is super silent. The lack of surface(or any other) noise, allowed whatever signal, however subtle to be laid bare before my very ears. That’s the advantage the Kronos has by design, the ability to allow more of the smallest, tiniest details to be relayed from cartridge to the phono stage, intact. In short. the Sparta reigns supreme in transparency. I heard details I’ve never heard before, even if I have listened to some of these favorite LPs, over and over again, through many years, and on many different turntables. These details, like midrange texture and harmonic shadings, are often lost in transition. Bass details are another strong point of the Kronos, often lost on most other turntables(especially those with acrylic platters). Now that we know the Kronos/ZYX combo is super silent and highly transparent, we can touch on tonal quality. Tonal response is dead neutral, which I believe is contributed by the cartridge. There’s not a hint of warmth, felt during play back. Having said that, the sound never, never seemed cold either. Highs are succinctly refined with a laid-back air of exquisiteness thrown in for good measure. The highs are always given the right degree prominence, just slightly behind in the sound stage, but yet with every attack and decay intact, before the next note rises. 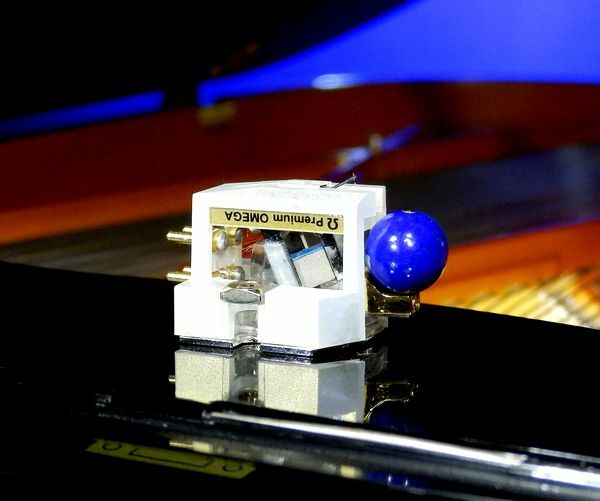 Unlike in lesser turntable/cartridge combo, the high frequencies can get out of control and outshine everything else, especially while playing complex or loud musical passages. The midrange has enough density and heft to project a well rounded vocalist image with solid presence. I mentioned flesh & blood quality in my recent review of the Tobian DAC T9, which means very much the same thing here, however special it was as a quality in the digital realm, these are often taken for granted in the analog domain. The Sparta often bewildered me when playing bass-heavy tracks, like those of rock, hip hop, rap or 80’s dance music. Rick Astley’s 80’s hit, Never Gonna Give You Up is a Stock Aitken Watermen classic that has lots of synthesized bass, layering one over another, with an actual bass guitar thrown into the mix. With the Sparta, I could so easily differentiate all these bass layers and I could follow them without having to struggle to tell them apart. This made music listening enjoyable,and gave me the boogie effect right away. I was dancing away to Rick Astley as he did on the MV of the song then (YouTube this if you’ve not yet seen it)! The whole experience allowed me to re-live my 80’s clubbing days, when DJs used to spin 12 inch singles and the dance floors were crowded. Only with a quality turntable like the Sparta, can I up the playback volume to dance club levels, and still enjoy the music in all its glory, never breaking up and becoming edgy. The Sparta also delivered some of the widest dynamic range on all recordings. Lows dive deeper and recover faster. Transients are as quick as they come and decay realistically (note above in this review that your choice of power cord effects this). Like most top shelf components, the Sparta/ZYX combo throws a big, wide and beyond the walls soundstage, with imaging stability and great presence. The staging and imaging scaling is life like in size, no bigger, not smaller either. It’s not only about how much elbow room each musician has to spare in the imaging, but it can also bring you back to the of the recording venue! U2‘s Rattle & Hum, a live recording of the band’s US tour in the late eighties is a good example of this. I’ve never quite gotten satisfactory playback of this 2 LP set until the I received my resident Kuzma turntable, but the Sparta brought this LP to a whole new levels of awesomeness. This LP has ‘live’ recordings from filled stadiums, or from little intimate street performances and even with a whole church choir. The Sparta/ZYX combo presented, not only the focus on the musical performances, but also the surrounding environment, with ambience and spatial reverbs at the upmost level. That effect, no single piece of hifi equipment has ever done so convincingly in my little man cave(some have came close, but none to this level of satisfaction)! In essence, I think I’ve just experienced the third degree of auditory 3D-ness! But wait, Victor came by one day and heard the Sparta playing in my system, and he came back the very next day with the two piece ASR Basis Exclusive phono amp(priced at RM$45,000.00), like as if this poison was not enough to kill me twice over already! He said the Kronos was capable of more and I needed a better phono stage. He immediately inserted the ASR to replace the Pass Labs X-Ono to prove his point! With the ASR, set to 55db gain in order to mimic the similar loudness from my system as in used with the Pass phono stage. Impedence loading was set to 100 ohms, because the ASR phono stage was already sounding very tight, grippy, and most importantly right with the music, we felt there was no need to further fiddle with it. With the ASR and the Kronos combo, music was played with a much tighter, faster and grippier pace. There was further reduction in the noise-floor and thus, improved transparency. There was some leanness to the mid range nevertheless, but overall, it just showed how much further the performance of the Kronos/ZYX could be had with a better phono-stage. Since the ASR is not the subject in review, it was quickly dispensed with it, once Victor made his point. Prices are subject to change based on daily RM to USD exchange rate fluctuations. As much as I’d like to say that I’ve always put my $$$ where my mouth is, as I’ve done so in the past, only this time the resources required goes way beyond the available contents in my treasure chest. However, I can only take these prices as an inspiration turn in to aspirational hifi as I’ve practiced in the past(like when I finally got the Marantz CD 7, after years of lusting for it), in hope that some day, I will finally join the club, for indeed the Kronos Sparta is the best analog experience I’ve had till date, and I speculate that probably only the Kronos Pro Ltd can do better. 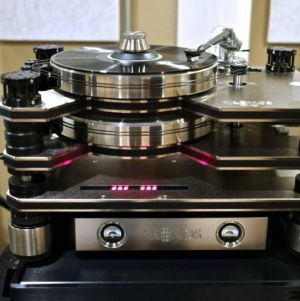 For those who are fortunate enough to have the resources and love to experience music reproduction at it’s pinacle, your journey starts here, with the Kronos Sparta! 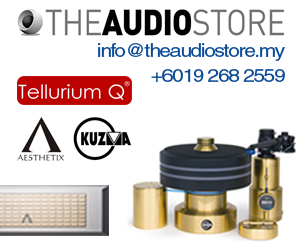 Kronos, ZYX & ASR are represented by HiFi-Creations. Please contact Victor Pheh at 012-2962799.